It's been one of the great gaming successes of Nintendo's storied career, so it should come as no surprise that the house of Mario is allegedly working on new Nintendo Switch consoles. 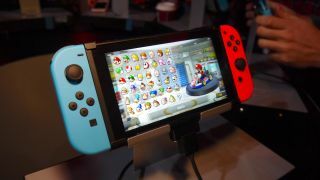 According the publication's sources, the first of these new devices will be aimed at budget gamers, and will see the Switch presented in a more traditional handheld-first format. It'll replace removable Joy-Cons with fixed ones, and ditch their HD Rumble feature in order to bring costs down, making it presumably more difficult to play in the docked mode with a TV without the purchase of a separate controller. The second new version of the Nintendo Switch, going by the rumor, is a little harder to pin down, but would be a premium version of the console with "enhanced features targeted at avid videogamers." That's not to suggest it would be aiming for 4K or HDR visuals, but would more likely have features and services baked in that would accommodate the modern obsession with streaming to platforms like Twitch. With your average console lifecycle floating around the five or six year mark, an announcement this summer to be followed by a winter release would see Nintendo on par for a mid-generation console refresh. It's far from unusual for Nintendo – everything from the Gameboy to the Wii to the 3DS received multiple updated across their life spans. This seems like a reasonable bet, and the Switch is one cow Nintendo will be keen to squeeze the Lon Lon milk out of.